Phannie is the first “phantom” for calibrating magnetic resonance imaging (MRI) machines that is traceable to standardized values. The plastic sphere is about the size of a person’s head and filled with 100 smaller spheres used as contrast-enhancing agents and measurement reference markers. The word “phantom” may conjure up scary ideas, like ghosts, delusions or fake bank accounts. But phantoms are also useful scientific devices. In the biomedical research community, medical imaging phantoms are objects used as stand-ins for human tissues to ensure that systems and methods for imaging the human body are operating correctly. NIST develops and disseminates phantoms as part of an ongoing effort to help ensure that medical images provide reliable and quantitative (measurable) information, not just nice pictures. NIST’s specialty is phantoms used to make measurements that are directly traceable, or linked, to national or international technical standards. Traceability means an unbroken chain of comparisons to generally accepted references. This ensures that the phantoms can provide the confidence needed to compare images taken on different scanning machines, or on the same machine at different times. NIST phantoms are often commercialized and used to calibrate—or compare to standard scales—imaging systems used in real-world settings, including major clinical trials. By developing phantoms to meet identified needs, NIST helps to ensure the accurate evaluation of cancers, brain injury and disease, medical implants and other conditions. NIST’s work helps the companies that make phantoms, and provides great benefits to the medical professionals and technicians who use them, and patients who receive better care because of them. Physicist Michael Boss with his prototype diffusion phantom for calibrating magnetic resonance imaging (MRI) scanners. The NIST phantom has been commercialized and is being used in clinical trials. Each NIST phantom is customized to fit a specific type of imaging system and measure relevant values for that system. NIST staff create phantoms out of hard, soft and digital materials that mimic the responses of human tissues under specific conditions. Materials are selected based on their similarity to human tissues in terms of properties such as density, stretching strength and hardness, as well as the material’s availability, cost and toxicity level. The materials include plastics, salt solutions, silicones, epoxy, polyurethane foams, carbon powder, water, disposable diapers and radioactive substances—whatever works best for a particular application. NIST staff test the relevant properties of candidate materials and use the best-performing ones to design and fabricate prototype phantoms. NIST either produces the phantoms, or transfers these models to companies, which manufacture and sell their own versions. Commercial phantoms are then purchased by medical facilities and manufacturers to compare scanner performance with respect to standards and other machines at different clinics. Among its contributions to the field, NIST has developed phantoms for magnetic resonance imaging (MRI), positron emission tomography (PET), computed tomography (CT or CAT), computer-assisted orthopedic surgery, optical medical imaging, digital computations and metal detectors. NIST has developed a variety of MRI phantoms, including the first one (named Phannie) for calibrating MRI machines that is traceable to standardized values. A phantom designed to standardize imaging of the diffusion of water molecules was commercialized rapidly, along with Phannie and NIST’s breast phantoms. Learn more about the impact of NIST's breast phantoms. 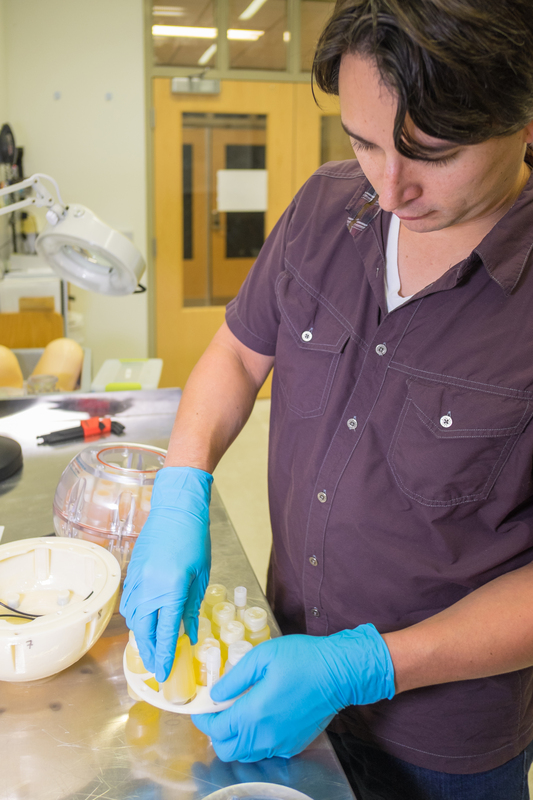 NIST also develops phantoms for novel MRI imaging techniques and works with academic and other collaborators on research studies and clinical trials, such as for detecting traumatic brain injury in veterans. 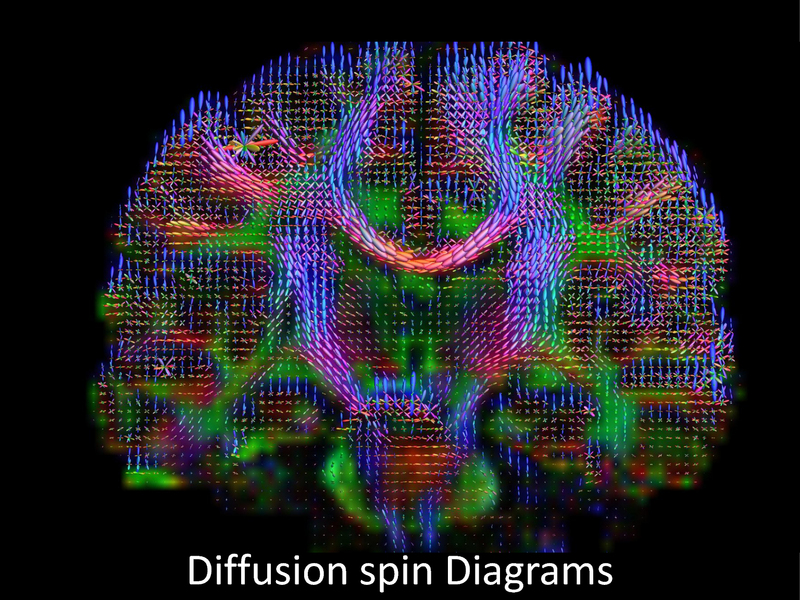 Brain wiring diagram made by high-definition fiber tracking magnetic resonance imaging (HDFT MRI) of water diffusion. The technique is useful for studies of traumatic brain injury. NIST demonstrated the first calibration system for PET scanners directly tied to national measurement standards. PET phantoms are unusual because the scanners detect radioactive materials injected in the patient. The phantoms are hollow cylinders that contain a small amount of radioactive germanium. This is part of a NIST effort to improve medical imaging, speed up clinical trials of drugs and support the development of more individualized medical treatment. NIST developed phantoms to improve CT scans, which use computer processing to combine multiple X-ray images into three-dimensional (3D) slices of the body that may reveal cancers or disease. 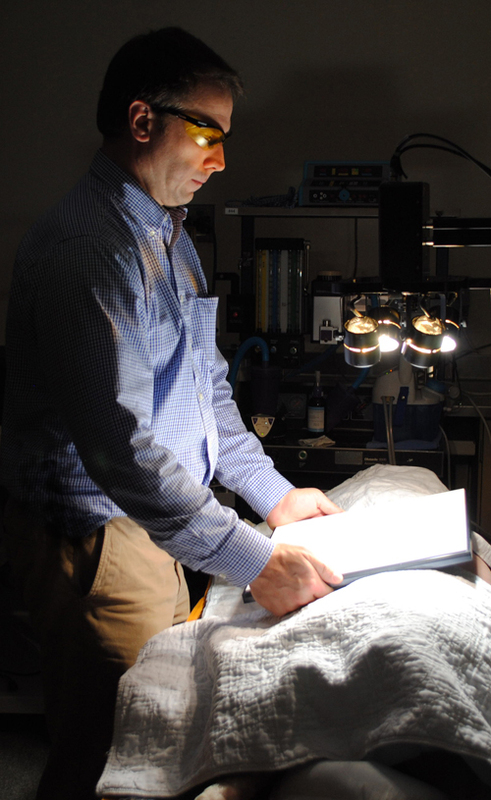 NIST phantoms include a standard reference material for lung tissue and disposable diapers, which contain known quantities of water, as stand-ins for tumors. Orthopedic surgeons need simple, lightweight phantoms to establish the traceability of length measurements performed with computer-assisted orthopedic surgery (CAOS) systems. NIST collaborated with medical professionals to develop novel CAOS phantoms such as a surrogate hip joint and pelvis. NIST has also developed digital phantom technology for optical medical imaging and other applications. A digital phantom is a data file containing an image that can be projected for viewing by an imaging system under evaluation. 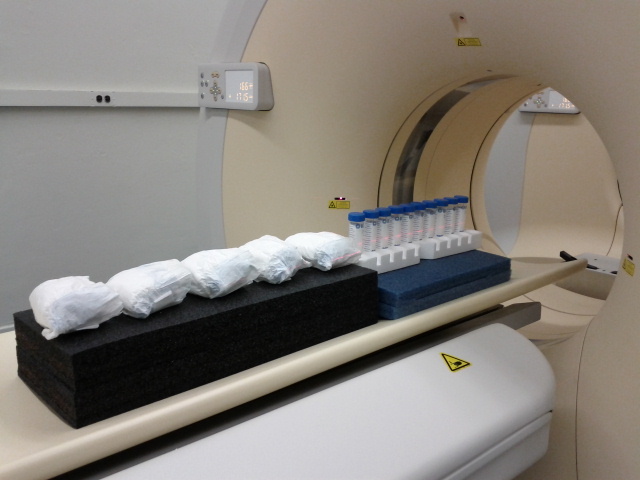 The image in the data file would include whatever item, such as a tumor, the imaging system is designed to detect. Such phantoms are useful for testing systems that are designed to automatically detect specific conditions. For example, NIST developed the first digital tissue phantoms for hyperspectral imaging to test the ability of an imager to noninvasively measure wound healing. The phantoms include a set of spectral signatures in the form of images that correspond to different amounts of oxygen in the tissue. Low oxygen levels indicate inadequate blood flow, which can ultimately result in cell death. Another NIST digital phantom, a computational human phantom, provides a dynamic 3D model of the human body for analysis of radio frequency (RF) signal propagation from medical implants and wearable sensors. Such models are used by electronics engineers to design wireless communication components. The dynamic model also allows researchers to study how motion affects wireless connectivity among implants and body sensors. The computational phantom also is being used as a 3D virtual reality-based testbed for studying wireless capsule endoscopy, or smart pills. Among non-medical applications, NIST developed an electromagnetic phantom—a carbon and polymer mixture that simulates the human body—to serve as a mannequin in a standardized performance test for walk-through metal detectors such as those used at airports. The NIST Magnetic Resonance Imaging (MRI) Standards Lab recently received the Governor's Award for High-Impact Research for advancing the forefront of biomedical imaging by developing a broad suite of calibration“phantoms” to enable quantitative MRI for the unambiguous measurement of disease progression and treatment efficacy. This video was produced by CO-LABS.